The global political and strategic scene this week has remained dominated by the news of North Korea's nuclear device. It should have come as no big surprise for the United States, China and Pakistan. China and Pakistan can be charged with the culpability of having been active accomplices in the materialization of the North Korean nuclear weapons capability; they contributed towards it by their acts of commission. The United States can be charged with major acts of omission in that as the only global superpower with awesome strategic and military power at its command and with unmatched intelligence resources, both human and technical, and having full knowledge as to what China and Pakistan were upto, it turned a blind eye to all the WMD proliferation that was taking place under its nose. The United States permissive policy attitudes and formulations on the North Korean nuclear program, determined by its tactical expedient policies towards China and Pakistan, reminds one of the proverbial 'Three Monkeys' that adorn the mantelpieces of many homes. 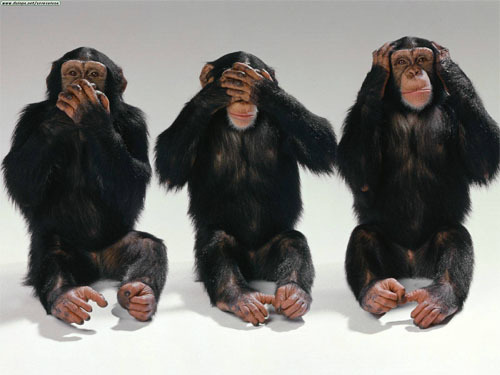 One monkey is depicted as having his hands on his eyes indicative of 'See No Evil'. The second monkey is depicted with his hands blocking his ears indicative of 'Hear No Evil'. And the third monkey is depicted with a finger on his lips indicative of 'Speak No Evil'. The United States responses were similar on the developing evil scenario of North Korea's nuclear weaponization with the active backing of China and Pakistan . It is a pity that the United States policy establishment spanning two Presidential Administrations of President Clinton and President Bush did not rap Pakistan's knuckles hard enough to deter it from facilitating the development of the latest nuclear threat against the United States and its allies in East Asia. The original sin in the acts of omission by the United States was committed by former President Clinton as under him the strategic mischief by China and Pakistan against the United States could have been nipped in the its nascent stages.
' Did North Korea have a scientific knowledge pool of scientists well versed in nuclear technology to come up with a nuclear device or nuclear weapons production?
' From where did North Korea acquire hi-tech machinery and instrumentation for nuclear weapons production, besides centrifuges required for enrichment?
' From where did North Korea acquire designs and blueprints for production of a nuclear device or bomb? The answers are obvious that all this came from external sources. With North Korea under imposed isolation from the United States and the West , the answers become obvious. North Korea is a satellite country of China with which it has both geographical contiguity and ideological affinity. Pakistan is China's strategic ally and also a recipient of Chinese largesse in terms of nuclear weapons capabilities and nuclear-capable missiles. China to equip itself with a plausible deniability exit brokered an arrangement whereby its nuclear weapons designs, technology and equipment provided to Pakistan earlier could now be passed on to North Korea in exchange for Chinese designed NoDong North Korean missiles with IRBM ranges. Following the 'See No Evil' precept, The United States throughout the 1990's and the first four years of the 21st Century, in the face of damnable evidence provided by CIA and other agencies around the world closed its eyes to nuclear proliferation. It first closed its eyes to China's nuclear weapons and nuclear-capable missiles proliferation to Pakistan. It later closed its eyes to Pakistan's nuclear weapons proliferation to North Korea which continued for at least four years after General Musharraf came into power and till two rears after 9/11 when USA beatified the Pakistani military dictator as the 'Great Crusader' against terrorism. Coming to the 'Hear No Evil' precept, the United States turned a deaf ear to plaintive cries by India about the evil of WMD proliferation being indulged by China to Pakistan and even before PSI came into existence India had intercepted shipments of North Korean missile components to Pakistan. President Clinton's Administration dismissed India's, CIA's and other reports against Chinese WMD proliferation to Pakistan on the grounds that since 'No Actionable Intelligence' was available it could not take action against China or Pakistan. The Bush Administration absolved General Musharraf and the Pakistani military hierarchy from complicity when Pakistan's complicity in providing North Korea with nuclear weapons production equipment and technical assistance came out in the open in 2004 and North Korea-Pakistan nuclear cooperation was taking place till 2003 ,that is for four years into General Musharraf's regime. The United States again for its tactical political expediency in relation to Pakistan became complicit in Pakistan's military dictator's campaign to deflect his own complicity in this evil game by spinning the yarn that the Pakistan- North Korea nuclear cooperation was the work of rogue scientists led by Dr A.Q. Khan for personal gains. It was a preposterous assertion by a military regime with an iron grip on Pakistan and the United States expected the world to believe it. Coming to the precept of 'Speak No Evil' the less said of the United States on this issue the better. While speaking 'No Evil' may be noble but supporting untruths, lies and devious assertions by the Pakistani military dictator is inexcusable when the CIA had provided evidence to the Bush Administration on the issue. It was laughable to hear the then US Secretary of State General Colin Powell react to Pakistan's exposure of nuclear weapons assistance to North Korea in words that General Musharraf had assured that the Pakistan Government was not involved in the deals and that he was 'four hundred percent' convinced of what he was told and had no reason to doubt the Pakistani General. Probably the General in Colin Powell got the better of him. The United States would not have been in the dilemma today that it is in on the North Korean nuclear weapons tests had it not adopted the 'Three Monkeys' precepts in dealing with China and Pakistan especially when the CIA and other global agencies started providing intelligence to the effect. North Korea's 'nuclear genii' is now out of the bottle and there is nothing that the United States can do about it other than making diplomatic noises. China and Pakistan must be now laughingly and jeeringly moving to the next target against the United States, namely Iran. Sadly, for United States' well-wishers like India and India at large, the past in terms of American permissiveness on China's and Pakistan's WMD proliferation has come to haunt it and its national security.